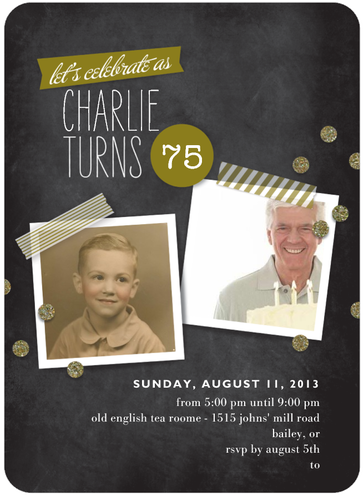 Delightful photo invitations are a wonderful way to show how much the birthday celebrant has changed over the years! These striking invitations have a blackboard effect background and feature 2 of your favorite snapshots. Personalize with any name and age, and add your own party details at the bottom. Choose 3 different trim colors, and 5 shapes for the cards themselves. Make managing your RSVPs easy with Tiny Print’s free Online RSVP service. You can also have Tiny Prints mail the cards directly to the recipients rather than addressing them yourself if you’d prefer – what a time saver! Minimum order size is 10 cards.